I got the best surprise on January 27th, 2012; my best friend asked me to marry him - without hesitation I said YES! 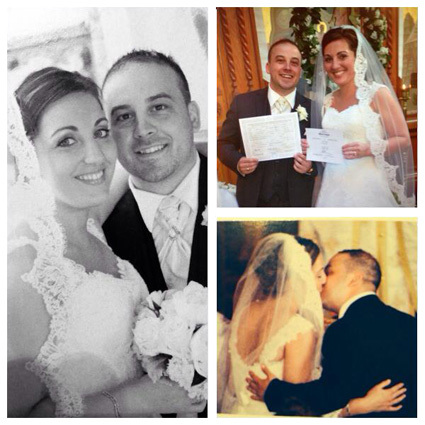 We then set our wedding date for June 1, 2013... Only there was one big twist, the future Mrs. Stephen Murano was marrying a man who owns a bridal store (Bridal Creations). As one would guess this seems like an overwhelming task. Paris had many questions like how do we be unique? Do we go over the top? What do I wear? With so many possibilities how could Paris possibly choose a wedding gown and her bridesmaid dresses. At this time Pina Murano (Stephen’s Mother - the founder of Bridal Creations) and Rosa (Stephen’s Aunt & Bridal Consultant) were the ones to help find Paris her dream gown. The wealth of knowledge Pina and Rosa had was invaluable. I was so lucky and felt so special, they had a plethora of gowns for every body size and shape and it was just a matter of finding THE dress I felt most comfortable and beautiful in. Luckily with Pina and Rosa’s guidance my experience was effortless and seamless. They turned my strapless gown into a beautiful gown with straps and a spanish lace veil to match - I love lace! In my mind I thought the bridesmaids would be more challenging, not everyone has the same body type and I wanted to be unique. I wanted my 8 bridesmaids to feel comfortable and so beautiful! Luckily enough Bridal Creations started carrying a new line - JS Collections. I went through the new line and picked out a beautiful black gown. I turned to my future mother-in-law and said “Is it bad if I put my bridesmaids in black?” without hesitation she replied “absolutely not, black is chic and timeless”. This was where our black and gold wedding theme was born. We wanted to be different but also look at our pictures in 20 years and think that they still look as amazing as the day we chose them. When it came to the guys, it was easy. I was marrying a man who knows everything there is to know about suits, tuxedo’s and accessories. I had full confidence in him to ensure the groomsmen, dads, and ring bearer’s were well taken care of - they all looked so handsome! I had such a special and memorable experience and it was all thanks to the staff at Bridal Creations. It was no small task marrying a man who owns a Bridal Store but with their patience and guidance, I felt confident in all of my choices and felt so special and beautiful in my dream gown. We are more in love now than the day we married each other and look forward to our ever changing love story.